President Obama gave his 15th news conference on mass shootings since taking office on the recent mass shooting at Umpqua Community College in Roseburg, Oregon. 10 lives including the shooter were taken and 7 were wounded. I don’t necessarily blame the shooter who was in all likelihood mentally deranged. I blame our legal and legislative systems as well as our often warped sense of civilized social values for allowing him and other killers such easily access to guns. The gunman reportedly owned 13 legally obtained guns plus plenty of ammunition. Had people not had such easy access to guns many of these tragic mass and daily shootings would not have occurred and more would still be alive today. I fear that there will be a day in which such occurrences will be on page 2 or higher of the news as are most of the more than 33,000 death related shootings annually in this nation, almost like having eleven 9/11’s each year. Though 10 lives pales in comparison to 33,000 deaths annually each life was precious to someone. We are all so acceptance of this as business as usual until a family member or friend falls victim to a shooting. 10 deaths still shocks the nation but 33,000 goes largely unnoticed. We justify the source of these deaths on the very narrow interpretation of the 2nd Amendment as “the right of the people to keep and bear Arms“. But how about “…certain unalienable Rights, that among these are Life, Liberty and the pursuit of Happiness“, the very essence for why people fought the British to create this great nation. Doesn’t this have any value or relevance any longer in our society or is it now too outdated and old fashion? The way the 2nd Amendment is worded leaves open another likely interpretation: “A well regulated Militia, being necessary to the security of a free State, the right of the people to keep and bear Arms, shall not be infringed.” But the right solely of gun ownership is the interpretation of the 5 to 4 ruling by the most recent majority conservative Supreme Court in District of Columbia v. Heller in 2008, essentially saying that an individual has a ‘right to possess a firearm for traditionally lawful purposes such as self-defense’ based largely on the traditions and history of gun ownership in the U.S. and totally dismissing the prefatory words “A well regulated Militia, being necessary to the security of a free State,…” as being irrelevant. Yet we are the only nation to have as part of our Constitutional the Right of gun ownership. Are we right and the rest of the world wrong? We have the highest per capita deaths by gun shootings in the world for a nation not in revolt. More citizens have been killed after the Civil War by domestic shootings than all our wars casualties combined. Some Republican candidates and pro-gun enthusiasts say gun ownership is not the problem. It is all about mental health. There is some truth to this but had these mass shooters not had easy access to guns would there have been so many of them? And what are Republicans doing to improve Mental Health? Easy access is a large part of the problem. Most of the people killed annually by others were not shot by people considered mentally deranged. It was done by shooters who had easy access to guns and used them to serve their purpose. The chart below summarizing CDC data on gun related deaths in 2011 illustrates the primary causes of gun related fatalities. The primary cause is self inflicted Suicides accounting for 61% followed by Homicides 34% followed by Justifiable Homicides (homicides by law enforcement and civilians defending themselves) 2% and Unintentional Deaths 2%. Even self defense accounts for less than 2% of gun fatalities so guns are seldom actually used for this purpose. 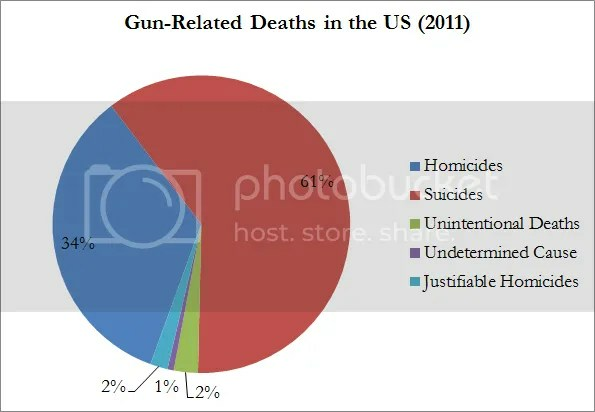 By making guns far less accessible to people all these gun related deaths could be reduced perhaps very significantly. That does not mean banning guns outright but voluntarily removing guns from the public and limiting their purchase. Sure people will continue killing themselves and others but it would be far more difficult and thus result in far fewer doing it. As long as gun ownership is a right the legal regulation of guns is greatly hampered. Suppose driving was a Constitutional right as some wrongly assume. Perhaps many of the laws governing cars and driving might be unconstitutional. So accidents, as horrendous as they are today, would be far worst due to the limitations imposed by the constitution. Airbags and seat belt could only be used optionally and not be part of law. Driving tests could not be mandated due to the constitution. Many ardent gun enthusiast use guns to kill game, but in fact far more people are hunted and killed each year. The reverse was true 200 years ago when people primarily used guns to hunt for food. We live in one of the most developed nations in the world yet we view guns as if we still lived in the pioneer days. Why can’t we treat every life as if it were precious, even more precious than our right to bear arms. Australia did it, so can we. Freedom of gun ownership is not the same as “…law(s) respecting an establishment of religion, or prohibiting the free exercise thereof; or abridging the freedom of speech, or of the press; or the right of the people peaceably to assemble, and to petition the Government for a redress of grievances.” Gun owners are not “…endowed by their Creator with certain unalienable Rights, that among these are…” gun ownership. Instead guns are harbingers of death and the absolute denial of “…Life, Liberty and the pursuit of Happiness.” What could be more unlike the spirit of this nation’s moral values as a civilized country. It is paradoxically morally corrupt. Here are some sobering statistics about deaths in the U.S. This entry was posted in Constitution, Crime & Justice, Government, Uncategorized and tagged 2nd amendment, easily access, gun ownership, legal and legislative systems, legally obtained guns, social values, Supreme Court ruling, Umpqua Community College. Bookmark the permalink.